New to Lake Norman Tennis? Tennis continues to be one of the fastest – growing traditional sports, not only nationally, but also locally. There are a wide range of playing options in the Lake Norman area for players of all ages & abilities. 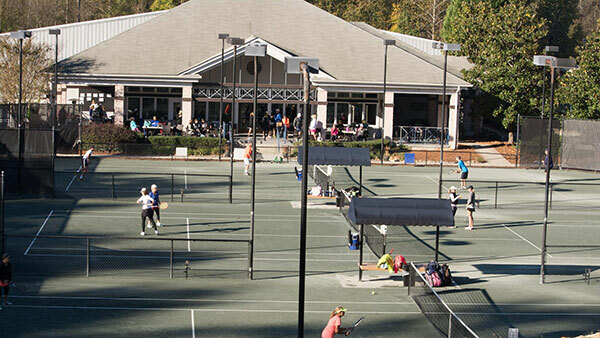 The Lake Norman Tennis Association (LNTA), in cooperation with the United States Tennis Association (USTA), area Parks & Recreation, and private clubs and tennis facilities, continually strives to offer high – quality tennis programs for our community. For junior players, LNTA sponsors spring & fall Junior Team Tennis (JTT), with different age & level options. For children aged 10 and under just learning the game, there is 10 U Tennis, a scaled – down program specifically designed for a younger child’s physical size & capabilities. There are approximately 180 junior teams playing throughout the year in Lake Norman. The Compass Draw is a tennis tournament that takes place over several months. Players schedule matches with opponents, about every 2 weeks, so it’s flexible and convenient. The best part? You get to keep playing, even when you lose! Men’s & Women’s Singles, Doubles, and Mixed Doubles are offered. Three qualifying tournaments are held throughout the year, as well as one invitational tournament. More information can be found by clicking here. The Piedmont Interclub League (PIC) is a non – USTA play opportunity for women in the Lake Norman area. This league consists of multiple divisions, and a variety of play levels are represented within each division. Six courts of doubles play each match. A unique feature of this league is that the home team provides lunch for both teams. This hospitality fosters a social atmosphere among teams. Click here to go directly to the PIC site.